Building A Relationship With Your Subscribers shows you how to tactfully and successfully create strong relationships with your subscribers so you can build your rock solid lists and generate your massively successful online marketing campaign that just doesn’t ever stop. Here you will gain the quality information required to take hold of your hot niche audience and shake them up a little in a positive manner. You will wow them and build trust and from there it’ll be just like stealing candy from a sleeping baby. You will succeed because that’s what you will have decided after listening to this massively fascinating download. You deserve to succeed and this is the platform to do it. It’s no secret that relationships are everything in life and this means you’ve got to like them big and strong and this is the route to do it. 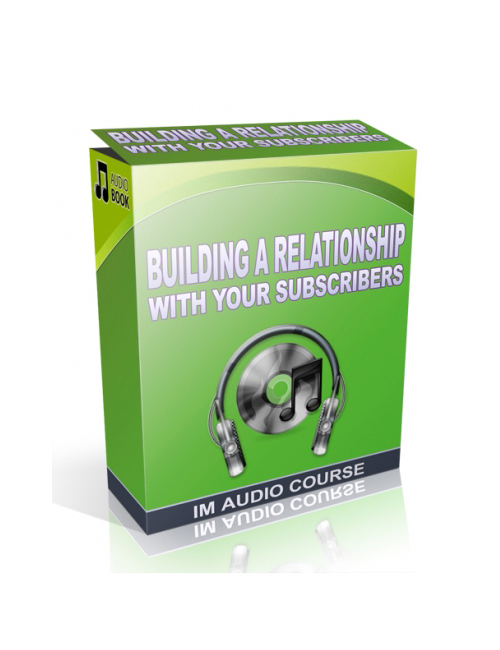 Building A Relationship With Your Subscribers is your best move today. Time to do it and forget about it. Download it today.